Working in the financial and retail sector, we’ve long been aware of the importance of employees having accurate and up-to-date product and service knowledge. The benefits of this are clear: if employees can retain key product knowledge in their heads throughout the year they’ll be fully equipped to hold successful conversations with their customers. Providing self-check quizzes on a regular basis is a great way to embed knowledge and identify any weaknesses across a company. Make it slick, fun and easy to use on a mobile or tablet on the way to work and it starts to sounds like a winner. We created a short, sharp and engaging user experience, supported by fully customisable MI for managers. We partnered with one of our long-term clients to shape a solution that was based on the solid foundation of a proven learning model – that regular repetition of questions and feedback will embed knowledge as learners practise retrieval of knowledge from memory. 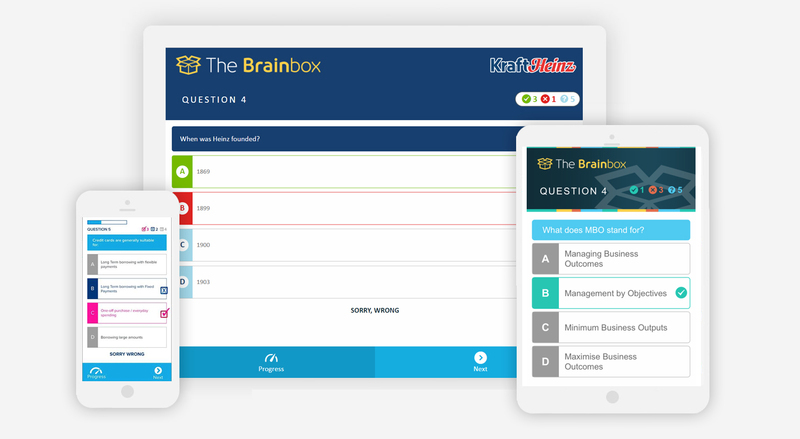 The result was a bespoke, multi-platform knowledge tool called ‘Brainbox’ which delivers regular, short, sharp multiple-choice questions to users on days and at times of their choice. 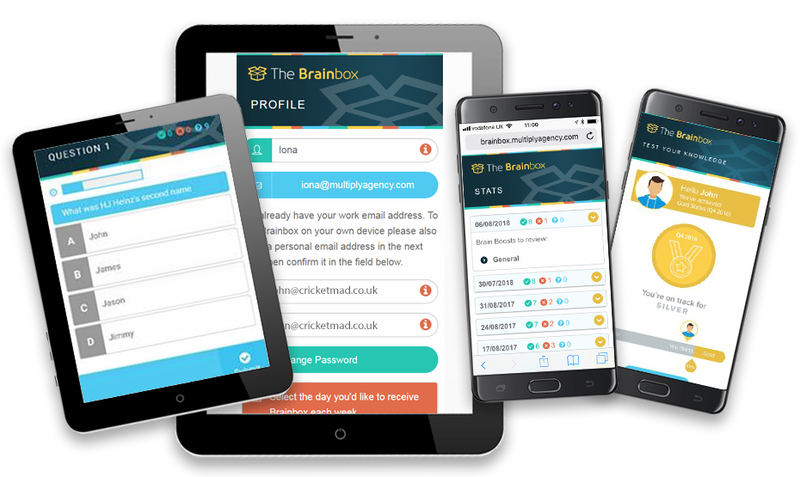 Brainbox is underpinned by a comprehensive database that uses a sophisticated algorithm to select a user’s questions based on their previous answers. Brainbox is fully responsive, running on individuals’ own devices (e.g. mobile phones and tablets) as well as on workplace desktops. 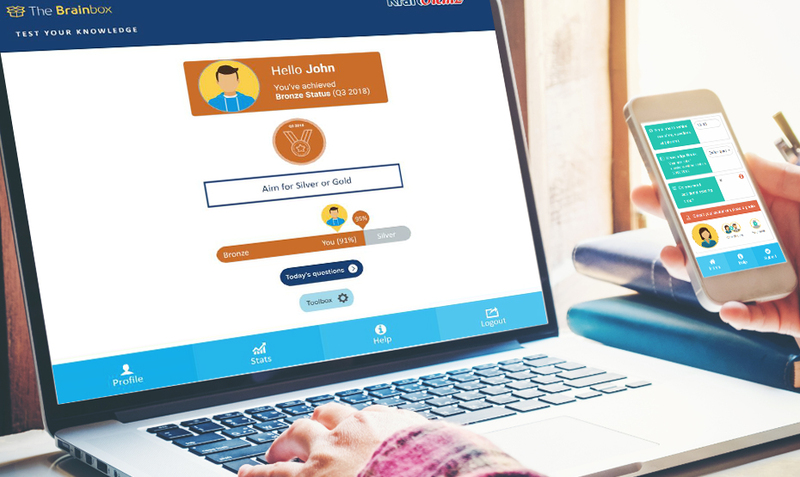 Users can personalise the experience by choosing their own avatar or photo and deciding which day of the week and at what time they receive their questions. They’re kept up to date with their progress towards bronze, silver and gold attainment levels and given feedback that encourages them to fill in any knowledge gaps in specific areas. 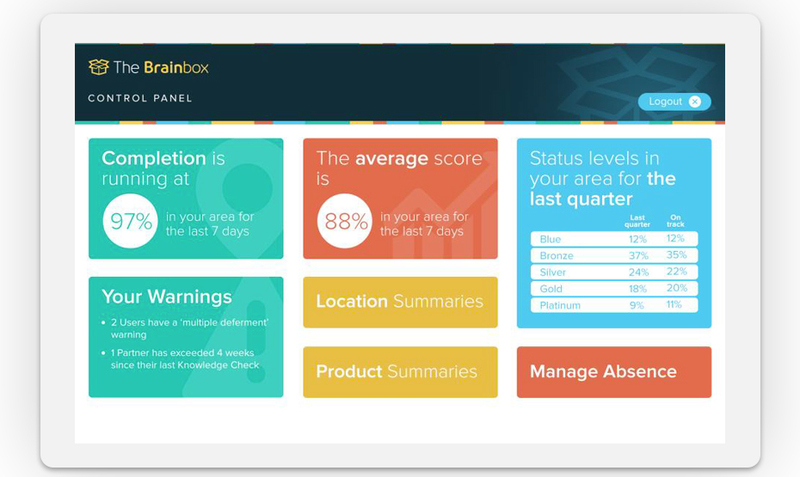 Brainbox also includes a comprehensive dashboard functionality that’s easy to access and delivers tailored statistics. Managers can access data across area, branches and products, helping them to identify trends, pinpoint any development areas and refine questions for the future. Brainbox is being used by a variety of clients in the financial and FMCG sector to maintain and improve product and service knowledge. We're ready. Ask for a demo.